We the undersigned, all of us members of the Rabbinical Council of America (RCA), including former RCA officers and executive committee members, decry the violation, by a small number of chaverim, of RCA policy on a very contentious issue that has been disapproved by the entire mainstream of Orthodoxy. In 2015, the RCA membership voted after unprecedented voter participation, for an RCA resolution that bars members from ordaining, training or hiring female clergy. This resolution came on the heels of multiple past resolutions and declarations expressing definite disapproval of the practice. Despite the consensus of mainstream Orthodox organizations, including but not limited to the RCA, the OU, the National Council of Young Israel, Agudath Israel of America, the Conference of European Rabbis and many others, a small number of RCA members are openly defying this ban. This is not the first time that an issue was found to be so egregious that adherence to the mainstream policy was deemed necessary for membership. Thus, in the past, some RCA members held pulpits at synagogues that had no mechitza, and those synagogues were even member organizations of the OU. 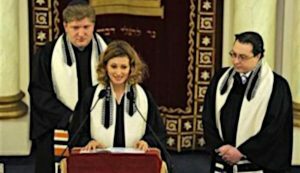 Nonetheless, the policy was firmly established requiring a mechitza for the synagogue and its rabbi to be considered Orthodox. Initially, outliers were grandfathered in as no new applicants in such situations were admitted, and later, the grandfathered congregations were offered the support to install a mechitza or expected to call a spade a spade and resign from the OU. The same applied to the rabbis of such congregations. Even though violators were few and far between, they could not be ignored, for they misrepresented Orthodox Judaism that the RCA upholds and they diluted the halachic standards of RCA membership. This applies every bit as much regarding the present challenge to Masorah. In some cases, the female rabbis are cleverly given non-clergy job descriptions, in order to evade outside criticism. Nonetheless, these female rabbis, who have Open Orthodox ordination and use rabbinic titles (including “Rabbanit” when their husbands are not rabbis), often perform full-blown rabbinic functions in the congregations of the offending RCA members, including the rabbinic functions described on pages 12-13 of the Orthodox Union rabbinic panel’s decision, which clearly proscribes such practices and bars Orthodox congregations from involvement therewith. The signatories below are signing on their own behalf, not on behalf of the RCA.